When a mysterious monster carves a path of destruction across the southern River Kingdoms, desperate townsfolk look to the famed elven ranger Elyana and her half-orc companion Drelm for salvation. For Drelm, however, the mission is about more than simple justice - it's about protecting the frontier town he's adopted as his home, and the woman he plans to marry. Together with the gun-slinging bounty hunter Lisette and several equally deadly allies, the heroes must set off into the wilderness, hunting a terrifying beast that will test their abilities - and their friendships-to the breaking point and beyond. But could it be that there's more to the murders than a simple rampaging beast? 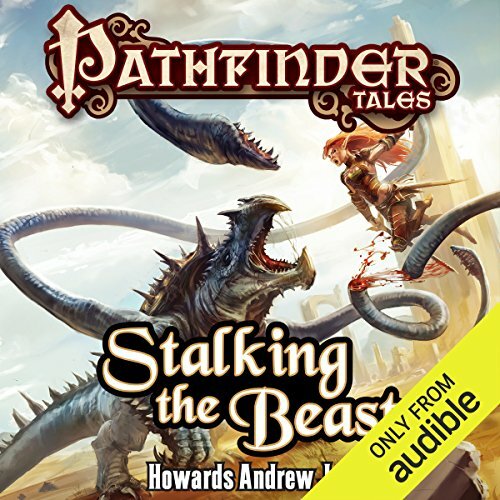 From critically acclaimed author Howard Andrew Jones comes a new adventure of love, betrayal, and unnatural creatures, set in the award-winning world of the Pathfinder Roleplaying Game. ©2013 Paizo Publishing, LLC (P)2015 Audible, Inc.
the only downside to this is that their are more than a few characters to keep track of. other than that everything was quite good. the beast was especialy fun. There were plenty of surprises, but the story dragged. Many of the names sounded a lot alike, so keeping track of minor characters was difficult. Some plot lines seemed a bit contrived. The story had just enough velcro, I wanted to find out how one storyline played out.